If you’re searching for a business-class four drive NAS device, you’ll find that most of your choices are Linux-based. Recently, both Buffalo Technology and Western Digital have introduced business-class NASes based on Windows Storage Server 2008 R2 technology. One of the obvious benefits of using the Windows Storage Server platform is the ease of integration into Windows Domain and Active Directory environments. 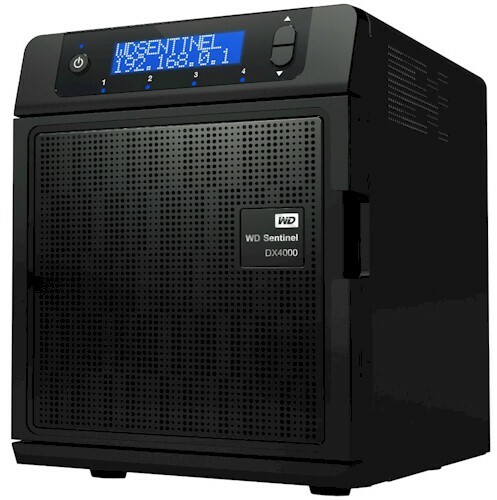 In this review, I’ll be focusing on Western Digital’s new Sentinel DX4000 Small Office Storage Server. The DX4000 is based on Windows Storage Server 2008 R2 Essentials – the entry level of Microsoft’s storage server product offerings. Tim already posted a hardware and performance review that you'll probably also want to read. I won’t be duplicating Tim’s content, but will focus on my installation experience and a walk through the DX4000's key features. The physical setup of the DX4000 is identical to virtually every other NAS product on the market. You plug it in to your Ethernet network, connect the power supply and press the power button. It takes the server a couple of minutes to start up. When the LCD display shows WDSENTINEL and the IP address is obtained from your network, you can begin your setup. The LCD screen shows you the progress of the setup and installation. After a few minutes you should see a screen indicating that the server is ready to use. You are warned that your computer may reboot several times during the installation process. In addition, your Windows computer must have Microsoft .NET 4.0 or later. If your computer doesn’t meet the minimum requirements, .Net will be installed as part of the installation. You are also informed that the installation process may take up to 30 minutes. I discovered during my attempt to install the connector software on multiple computers, that you could only have one installation running at a time. Figure 3 shows the error code that you receive if you try to run simultaneous installations on multiple systems. To me, this could be a problem if you plan to deploy the DX4000 to a medium-sized office. If each installation could take up to 30 minutes, and you have 20 installations to do, it could take well over a day to deploy the connector on all systems. Fortunately, the connector isn’t mandatory. If you’re willing to give up the benefits shown in Figure 2, you can merely connect to shares that an administrator has previously configured for you. During the installation process, you will be prompted for the administrator password and will be asked to create a unique name for the computer that you are connecting to the server. You will also be given the option to allow the server to wake up the computer (if supported) for backups. Finally, you will be given the option to participate in a Microsoft customer experience improvement program. If all goes well, you’ll see a screen confirming that the software was installed properly. Unfortunately, my experience with installing the connector client wasn’t a positive one. I had difficulties installing the client on two Windows XP systems as well as on my Windows 7 64 bit system. WD recommends that all systems be completely up-to-date with all patches applied. For one of my XP systems, I received the error shown in Figure 4. I checked my system time and re-synchronized it with a stratum 1 NTP server and tried to reinstall the software. I then received the warning shown in Figure 5 – most likely due to my failed first attempt. I finally decided to contact tech support. I actually hadn't yet found the Win 7/IE 9 solution described above when I made the call. So I had not successfully installed connector software on any of my Windows systems. This means I didn't have access to the administrator’s dashboard that would allow me to gracefully reboot the server through the administrative interface. So the support tech instructed me to pull the power plug to reboot the server. In retrospect, that wasn’t such a good idea. It probably would have been better to reboot the server by using the power switch, which executes a graceful shutdown. I think I was the first DX4000 tech support call and support has now been instructed not to have customers pull the DX4000's plug. While rebooting the server seemed to enable me to install the connector software on both of my XP Windows computers, the ungraceful shutdown had a very bad side effect – the RAID5 drive array started resynchronizing. The resync process lasted 6 days and 8 hours – a time period that I considered far north of excessive. Part of the problem with the extended synchronization period was that one of my networked computers was also running its initial full backup. Still, when I discussed the extended RAID resynchronization time with Western Digital, they didn’t seem at all surprised at how long it was taking. In fact, they felt the longer resync time was a plus, because they claim to do a more thorough rebuild than their competitors. For the sake of comparison, I looked back at some of my reviews of other RAID systems to see how long aRAID rebuilds took. On a 5 TB Lacie 5Big-2 NAS, the RAID rebuild took 8 hours and 15 minutes. On a 1 TB Buffalo TeraStation Pro II, it took 1 1/2 hours. The problems with the extended RAID rebuild on the DX4000 are twofold. First, during the RAID rebuild, the DX4000 is painfully slow. Throughput drops to a fraction of its benchmarked performance. Even access to the administrator’s console took close to two minutes to launch. The second problem is that during the RAID rebuild, you no longer have fault tolerance. A drive failure during the rebuild process will result in total data loss. Though WD did agree that the rebuild time was long, they felt that a rebuild is really a rare anomaly that shouldn’t occur normally. So unless you want to repeat my painful experience, never, ever unplug the DX4000 while it’s running. Do a graceful shutdown using the front panel power switch. You should also plug the DX4000 (or any NAS) into a UPS. But note that while the DX4000 administrator’s guide makes a reference to connecting a UPS to one of the USB ports, it provides no information on how to configure it, or what UPS brands are supported.